I had CPT’s new vision statement in mind as I set out on the half hour walk to Sulaimani’s Azadi Park. The dust storm of the night before had blown away, leaving behind a cool breeze and hot sun. CPT Iraqi Kurdistan’s friend Anna Bachman who works with Nature Iraq had informed us of the first “Green Music and Arts Festival.” I offered to arrive at the site early to help with set up. Nature Iraq and the other sponsoring organizations know that Kurdistan is struggling with the concept of caring for all creation. War and oppression came upon the region around the same time as companies decided that packaging food in plastic was a good thing to do. The citizens did not know what to do with all these containers. One person has said to me, “but they can just lie there, the sun will make it go away.” Meanwhile the landscape and rivers are littered with the leftovers. Now, in 2012 life seems to be pretty good here. The economy has improved symbolized by large amounts of construction with concrete cinderblocks which are created on the edge of rivers, as well as many more vehicles on the roads, leading to more air pollution. The organizers hoped that the Green Festival would bring some of these issues to the attention of the Kurds of Sulaimani. And they were successful. Around 2000 people left their leisurely stroll around the park to listen to Kurdish and American music and look at the displays. 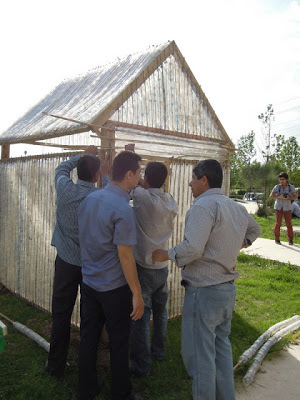 They were able to see that the ubiquitous 250 milliliter water bottle could be threaded onto a wooden frame to create a green house. They heard from high school students that wind and solar power are something that could be considered in this region. They saw the advantages of placing trash into receptacles that would go to the dump. They were reminded by the many nature photographs and paintings that their region has so much beauty that must be maintained. Yet, as I walked around the exhibits I saw one that would not be present at the Earth Day festivals in Canada. The Mine Action Professional Organization had created a simulated minefield with about 100 different kinds of defused mines and bombs. They wanted the citizens to remember that there are still around 7 million mines left over from the Iran-Iraq War of the 1980’s. The exhibitor told me that there have been 14,000 victims since 1991 and education is the only reason this has decreased to only 40 incidents in 2011. I thought of our partners in the mountains who face these land mines on a daily basis. The lack of financial resources which have been put into just surviving, the lack of psychic energy to think of what to do with the plethora of plastic and other pollutants, and the dangerous residual evidence of a time of war, are all factors that leads to a region struggling to become reacquainted with the land.